Electric towel rails for bathrooms are the perfect solution for drying towels during the summer months when a plumbed in heating system is generally switched off. Simply switch on as and when required, dry your towels or heat the bathroom then switch off, lowering fuel bills. Our wall mounted electric radiators are available in many popular sizes including some slimline designs to fit into the smallest of bathroom spaces. Needless to say all have a luxurious chrome finish on round or square rung tubing that will compliment any bathroom. Some models have a simple on/off switch while others are available with a built in thermostat to get just the right temperature for you. 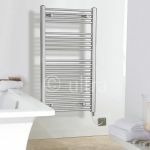 Take control of the heating by installing an electric towel rail for your bathroom.